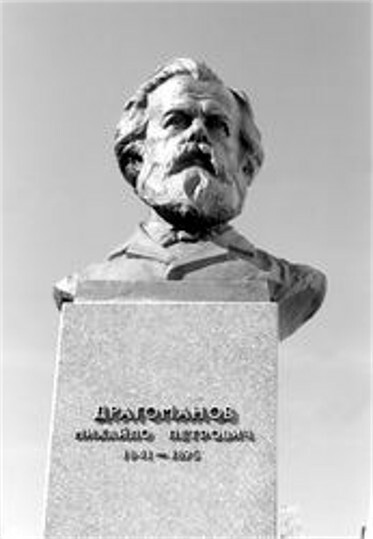 Drahomanov, Mykhailo [Драгоманов, Михайло], b 6 September 1841 in Hadiach, Poltava gubernia, d 20 July 1895 in Sofia, Bulgaria. Scholar, civic leader, publicist, political thinker. Born into a gentry family of Cossack origin, Drahomanov studied at Kyiv University, where in 1864 he became privat docent, and in 1873, docent, lecturing on ancient history. While pursuing an academic career, Drahomanov rose to a position of leadership in the Ukrainian secret society the Hromada of Kyiv (later known as the Old Hromada) and took part in its various activities, such as the transformation of the Southwestern Branch of the Imperial Russian Geographic Society into a center of Ukrainian studies and the editing of the daily Kievskii telegraf. 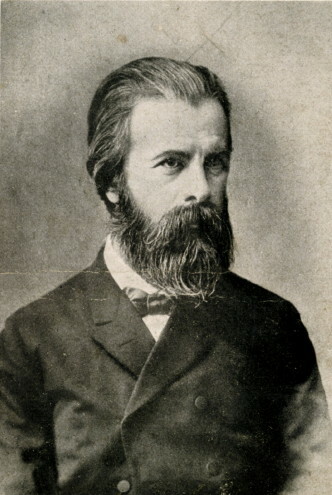 During his trips abroad Drahomanov established contacts with Galician Ukrainians; under his influence the Russophile Academic Circle in Lviv associated with the journal Druh adopted a Ukrainian democratic platform in 1875–6. Among the Russian educated public Drahomanov attracted attention with his articles (in Vestnik Evropy and elsewhere), in which he critically discussed Russia's internal and foreign policies. 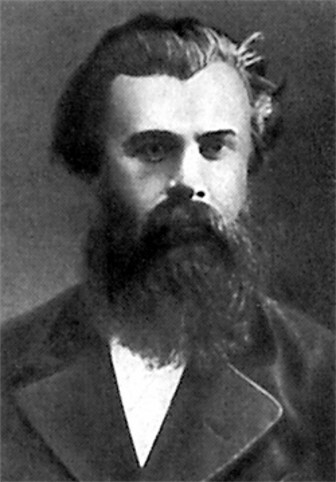 Drahomanov became an early victim of anti-Ukrainian repressive measures by the Russian government and was dismissed in 1875 from the Kyiv University. Entrusted by the Hromada with the mission to become its spokesman in Western Europe, he settled in Geneva in 1876. 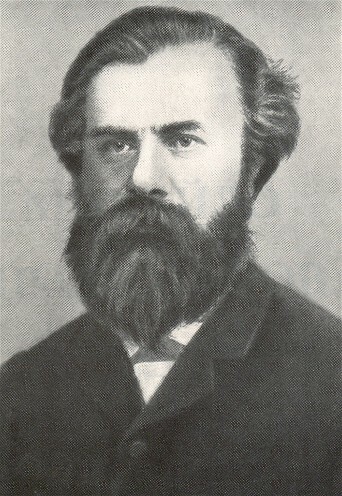 Aided by Antin Liakhotsky (Kuzma), he published the journal Hromada (Geneva) (5 vols, 1878–82), the first modern Ukrainian political journal, and a number of pamphlets, mostly in Russian. With Serhii Podolynsky and Mykhailo Pavlyk, who for some time joined him in Switzerland, Drahomanov formed the Geneva Circle, an embryo of Ukrainian socialism. He strove to alert European opinion to the plight of the Ukrainian people under tsarism by pamphlets (La littérature oukrainienne proscrite par le gouvernement russe, 1878) and articles in the French, Italian, and Swiss press. Drahomanov also played a prominent role in the Russian émigré community; he edited Vol’noe slovo, the organ of the zemstvo liberals. His contacts extended to Polish, Jewish, Serbian, Bulgarian, and Romanian radicals and groups. In 1886 a rift occurred between Drahomanov and the Hromada of Kyiv; the latter felt that political activity abroad might provoke increased anti-Ukrainian repression. The socialist stance adopted by Drahomanov in exile was often at variance with the moderate views of the Hromada members. Drahomanov also antagonized Russian émigré factions by his constitutionalism and sharp criticism of the Russian revolutionaries’ dictatorial proclivities and covert chauvinism. In Galicia, too, Drahomanov’s followers (Ivan Franko, Pavlyk, Ostap Terletsky) suffered persecution from the Austro-Polish administration and ostracism from the local clerical-conservative Ukrainian society. By the mid-1880s Drahomanov found himself in isolation and deprived of Hromada’s financial support. 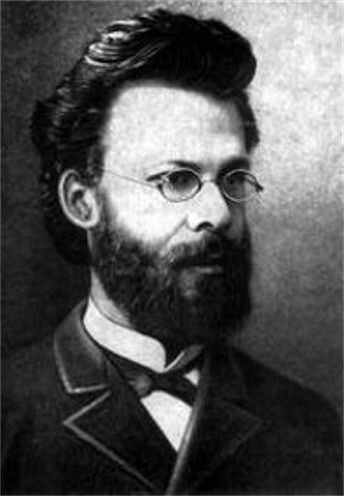 In 1889 Drahomanov accepted a professorship at Sofia University. During his last years he saw the rise of the Ruthenian-Ukrainian Radical party, founded in 1890 by his Galician followers. Drahomanov was their mentor through his intensive correspondence and programmatic articles in the party's organ, Narod. He also contributed to the London monthly Free Russia, edited by Sergei Kravchinsky (Sergius Stepniak). Soon after his move to Bulgaria, Drahomanov developed a heart ailment. He died and was buried in Sofia. 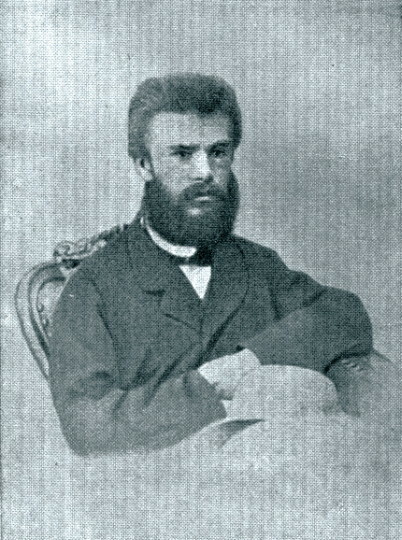 Drahomanov began his scholarly work as an ancient historian and wrote Vopros ob istoricheskom znachenii Rimskoi imperii i Tatsit (The Problem of the Historical Significance of the Roman Empire and Tacitus, 1869). Later he worked in Slavic, especially Ukrainian, ethnography and folklore, using the historical-comparative method. Drahomanov applied folk oral literature to his study of the history of social ideas in Ukraine. His principal works are Istoricheskie pesni malorusskogo naroda (Historical Songs of the Little Russian People, with Volodymyr Antonovych, 2 vols, 1874–5); Malorusskie narodnye predaniia i rasskazy (Little Russian Folk Legends and Tales, 1876); Novi ukraïns’ki pisni pro hromads’ki spravy (Recent Ukrainian Songs on Social Topics, 1881); and Politychni pisni ukraïns’koho narodu 18–19 st. (Political Songs of the Ukrainian People in the 18th and 19th Centuries, 2 vols, 1883–5). Drahomanov’s articles appeared in foreign journals (Mélusine and others). Notes on the Slavic Religio-Ethical Legends: The Dualistic Creation of the World (Bloomington, Ind 1961) is an English translation of one of his works that was originally published in Bulgarian. Drahomanov declared himself a socialist, without subscribing to any school of contemporary socialist thought. The motivation for his socialism was ethical: concern for social justice and the underprivileged and exploited. He advanced a program of concrete socioeconomic reforms (eg, protective labor legislation, progressive income tax). Drahomanov was convinced that in agrarian Ukraine socialism must be oriented towards the peasantry. Therefore, he may be classified as a populist in the broad sense of the term, although he objected to some features of Russian populism (eg, the glorification of peasant revolts and disregard for Western-type liberal institutions). 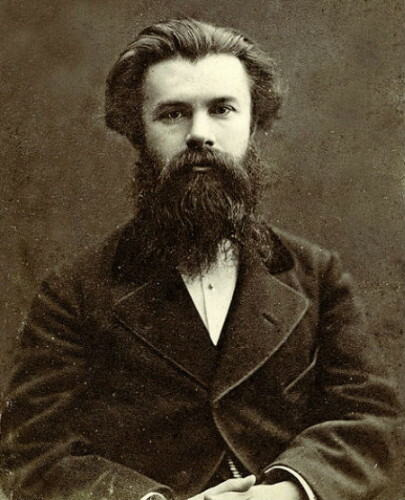 Drahomanov rejected Marxism, especially the materialist interpretation of history. Drahomanov continued the democratic-federalist tradition as represented by the Ukrainian Decembrist movement of the 1820s (the Society of United Slavs, of which his uncle, Yakiv Drahomanov, had been a member), and the Cyril and Methodius Brotherhood. He wished to link the Ukrainian movement with progressive trends in the contemporary Western world. Drahomanov regretted that the Ukrainian people had not preserved an independent state in the past. However, he thought that a policy of separatism was unrealistic, and his philosophical anarchism did not allow him to envisage national statehood as an objective. He admonished his compatriots to concentrate on the democratization and federalization of the existing states of Russia and Austria-Hungary, which he thought would provide sufficient scope for the free development of the Ukrainian nation. He postulated collaboration with all peoples of Eastern Europe, including Russians. Yet, Drahomanov insisted on the organizational independence of the Ukrainian movement. He combated both the concept of ‘non-political cultural work’ (Hromada of Kyiv’s preference in the 1880s) and the Ukrainians’ participation in Russian revolutionary organizations, which alienated them from their own people. Drahomanov’s vision embraced all ethnic Ukrainian lands. He was the first national leader to visit Transcarpathia, and he developed a lasting commitment to ‘the wounded brother’. Drahomanov envisaged a systematic co-operation among various Ukrainian lands, cutting across state boundaries. He proposed that until the overthrow of Russian autocracy the center of the national movement should be located in Galicia, where the constitutional regime offered some opportunities. It was imperative for Galician Ukrainians, however, to rid themselves of their provincial and clerical outlook. Drahomanov pleaded for secularization of Ukrainian civic and cultural life, and church-state separation. Considering Protestantism more amenable to progress than either Orthodoxy or Catholicism, Drahomanov showed interest in the emergence of evangelical sects in Ukraine. He wrote a series of tracts to encourage religious non-conformity and anticlericalism. Drahomanov consistently opposed expressions of a xenophobic Ukrainian nationalism and defended the usefulness of progressive Russian literature for Ukrainians. He maintained that national liberation was inseparable from social emancipation. He called on the intelligentsia to work for the uplifting of the masses through education, economic improvement, political participation, and the building of popular associations. Viewing the Ukrainian problem in a broad context, Drahomanov devoted attention to Ukraine’s neighbors. Concerning Russia, he advocated a common front of moderate liberals and revolutionary socialists against autocracy, but condemned terrorist methods. 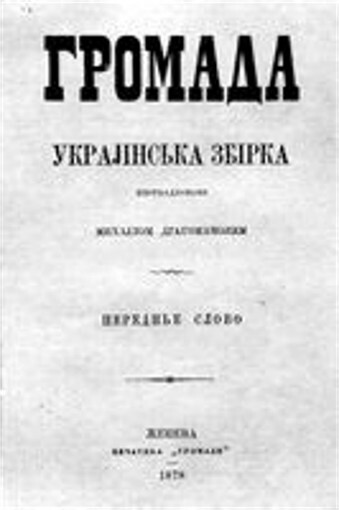 Drahomanov drafted a proposal for a constitutional reorganization of Russia (Vol’nyi soiuz/Vil’na spilka [A Free Union], 1884) with rule of law, guarantees of civil rights, regional and local self-government, and equality of nationalities. (Max Weber praised Drahomanov’s constitutional plan for its treatment of the nationality problem.) Drahomanov endorsed the right of minorities in Ukraine, particularly the Jews, to a corporate national-cultural autonomy. He welcomed the liberation of the southern Slavs from the Turks but cautioned against tsarist imperialism in the Balkans. He criticized equally the Russian oppression of Poland and Polish claims to lands where the majority of the population was ethnically non-Polish. He saw threats to Eastern Europe in Prusso-German militarism, in the inflated territorial aspirations of the Polish ‘historical’ patriots, and in the ‘Jacobinism’ of Russian revolutionary groups. Drahomanov’s principal political works are ‘Perednie slovo do “Hromady”’ (Introduction to Hromada, 1878), ‘Propashchyi chas—ukraïntsi pid Moskovs’kym tsarstvom, 1654–1876’ (The Lost Epoch: Ukrainians under the Muscovite Tsardom, 1654–1876, written in about 1878, publ 1909), ‘Shevchenko, ukraïnofily i sotsiializm’ (Shevchenko, the Ukrainophiles, and Socialism, 1879), Istoricheskaia Pol’sha i velikorusskaia demokratiia (Historical Poland and Great Russian Democracy, 1881–2), Vol’nyi soiuz/ Vil’na spilka (A Free Union, 1884), Liberalizm i zemstvo v Rossii (Liberalism and Zemstvo in Russia, 1889), Chudats’ki dumky pro ukraïns’ku natsional’nu spravu (Eccentric Thoughts on the Ukrainian National Problem, 1891), Lysty na Naddniprians’ku Ukraïnu (Letters to Dnieper Ukraine, 1893). Drahomanov’s contributions to the study of Russian social thought include his editions, with introductory essays, of Pis’ma K.D. Kavelina i I.S. Turgeneva k A.I. Gertsenu (Letters of Komstantin D. Kavelin and Ivan Turgenev to Aleksandr Herzen, 1892) and Pis’ma M.A. Bakunina k A.I. Gertsenu I N.P. Ogarevu (Letters of M.A. Bakunin to A.I. Herzen and N.P. Ogarev, 1896). 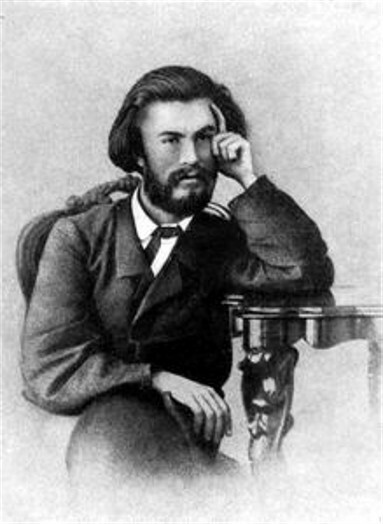 A notable part of Drahomanov’s works are his memoiristic and epistolary writings: ‘Avtobiograficheskaia zametka’ (Autobiographical Note, 1883) with a ‘Dobavlenie’ (Supplement, 1889) and Avstrorus’ki spomyny, 1867–1877 (Austro-Ruthenian Reminiscences, 1867–1877, 1889–92). He corresponded with Mykhailo Pavlyk (7 vols), Ivan Franko (2 vols), and Meliton Buchynsky, Volodymyr Navrotsky, Teofil Okunevsky, and Nataliia Kobrynska (1 vol each), among others. Of particular historical importance is Arkhiv M. Drahomanova: Lystuvannia Kyïvs’koï Staroï Hromady z M. Drahomanovym 1870–1895 (The Archives of M. Drahomanov: Correspondence of the Kyiv Old Hromada with M. Drahomanov in 1870–1895, 1937). Also of considerable interest is personal correspondence from Drahomanov in the last decade of his life that is reproduced in Materiialy do istoriï literatury i hromads’koï dumky, eds Bohdan Struminsky and Marta Skorupska (New York 1992). Drahomanov’s impact was strongest in Galicia, where it extended not only to the Radicals, but also to segments of the National Populists (narodovtsi). In Russian-ruled Ukraine his influence was checked by the conflict with the Old Hromada. However, some activists continued to support him: Mykola Kovalevsky, Yakiv Shulhyn, Volodymyr Malovany, Yevhen Chykalenko, and Bohdan Kistiakovsky. Scattered ‘Drahomanovian circles’ also existed. Drahomanov's ideological legacy is partially reflected in the basic political orientation of the Central Rada in 1917 (the concept of an autonomous Ukraine within a federated Russian republic) and in the Rada's specific policy measures, such as the Congress of Peoples of Russia in Kyiv and the national-cultural autonomy of minorities. Of the political parties of 1917–21, the one closest to the Drahomanov tradition was the Ukrainian Party of Socialists-Federalists; certain prominent Socialist Revolutionaries (Mykyta Shapoval, Nykyfor Hryhoriiv) ‘rediscovered’ Drahomanov only in exile. During the interwar era reaction against him took place among Ukrainians outside the USSR—a symptom of the general ‘turn to the right’ in Ukrainian politics. Representative publicists of the integral nationalist movement (Dmytro Dontsov, Mykhailo Mukhyn) attacked Drahomanov, charging him with the moral responsibility for the failure of the Ukrainian struggle for independence (1917–20). 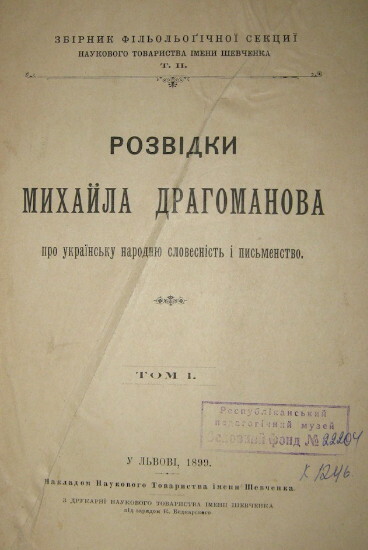 In Soviet Ukraine some objective scholarly research on Drahomanov was undertaken in the 1920s (David Zaslavsky and others). With the advent of Stalinism Drahomanov was condemned as a ‘petit bourgeois liberal’ and ‘Ukrainian nationalist’. After a lapse of more than 30 years, a new interest in Drahomanov surfaced among Soviet Ukrainian intellectuals in the post-Stalin period, culminating in the 1970 edition of his selected works. The authors who wrote on Drahomanov during the comparatively liberal 1960s (Raisa Ivanova [Ivanchenko], Ivan Romanchenko, Volodymyr Sokurenko, and others) took care to play down the features of his thought that were incompatible with Soviet ideological orthodoxy. Despite this, the revival of Drahomanov studies was censured in the early 1970s (Komunist Ukraïny, 1972, no. 11). In the countries of the socialist bloc research on Drahomanov was carried on by Petko Atanasov (Bulgaria) and Elżbieta Hornowa (Poland). Drahomanov studies returned to the stage in Ukraine during the political changes initiated in the latter 1980s. 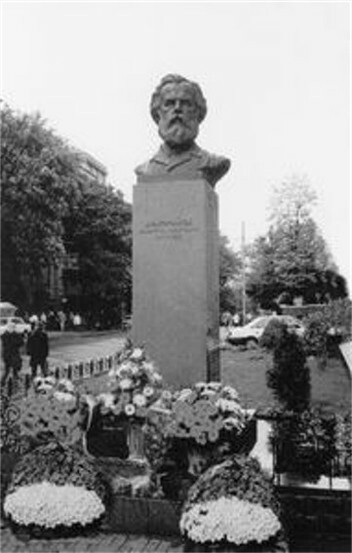 Initially these were cautious efforts that sought to fit Drahomanov within the rubric of a now more flexible official socialist ideology, but this expanded fairly soon to include a consideration of Drahomanov’s ideas as an alternative (Ukrainian) Marxist socialism—particularly in the part of Ukrainian literary critics (including, among others, Rostyslav Mishchuk, Oleksa Myshanych, and Mykola Zhulynsky). In 1991 a number of major Drahomanov conferences held in Ukraine brought new perspectives to Drahomanov studies. In post-Independence Ukraine the field has grown substantively and qualitatively. 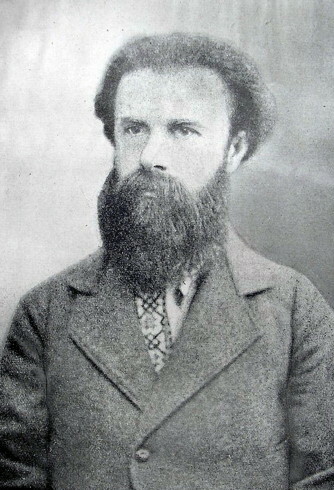 The growth of interest in the history of Ukrainian political thought has increased Drahomanov’s profile, and there have been numerous studies of his views. B. Kistiakovs’kyi's introductory essays to the Paris (1905–6) and Moscow (1908) editions of Drahomanov’s works. [This article originally appeared in the Encyclopedia of Ukraine, vol. 1 (1984). A referral to this page is found in 104 entries.